The Engineer 1955 Jul-Dec: Index. Allen, W. H., Sons and Co., Ltd., Gas Turbo-Generator. Suppt., 2.9.55, i. Generating Set. Suppt., 2.9.55, ii. Ashworth Ross and Co., Ltd., Vertical Centrifugal Cargo Pump, Suppt., 2.9.55, xi. Babcock and Wilcox Company, Hot Extrusion of Stainless and Alloy Steel Tubing, 26: Nuclear Power Station for New York, 59 Radiographic Inspection Tool, 204 Research Centre at Alliance, Ohio, 274, 310 Work of the U.S. Atomic Energy Commission, 599 Babcock and Wilcox Ltd., Constructional Group for Atomic Power Stations, Installation of a 2,000-ton Forging Press, 71 A Tractable Marine Boiler, 161 Exhibition of Peaceful Uses of Atomic Energy at Geneva, 190 Progress at Calder Hall Power Station, 767 Automatic Oil-Fired "Packaged" Boilers, Suppt., 2.9.55, v.
Belliss and Morcom, Ltd., Steam Turbine Plant, Suppt., 2.9.55, xv. Air Compressor. Suppt., 2.9.55, xv. Birlec. Ltd., Mains-Frequency Coreless Induction Furnaces. 701 Extrusion Plant for Aluminium Alloys, 804 Heat Treatment Furnace, Suppt., 2.9.55, xi. Buckley and Taylor, Ltd., Diesel Marine Engine, Suppt., 2.9.55, iv. C.A.V., Ltd., Fuel Injection Equipment, Suppt., 2.9.55, xii. Consolidated Pneumatic Tool Co., Ltd., "Power Vane" Compressor, Suppt., 2.9.55, ix. Davey, Paxman and Co., Ltd., Diesel Engines for Railway Traction, 236 British Railways Contracts for Diesel Locomotives. 763 Horizontal Diesel Engine for Rail Traction, Suppt., 2.9.55, vi. Dowty Hydraulic Units, Ltd., Hydraulic Pump. Suppt., 2.9.55, vii. Everett Edgcumbe and Co., Ltd., Vertical Centrifugal Cargo Pump, Suppt., 2.9.55, xiv. Fuel Firing, Ltd., Combined Pulverised Coal and Oil Fuel Firing for Power Stations. 158 Portable Electric Igniter, Suppt., 2.9.55, x. 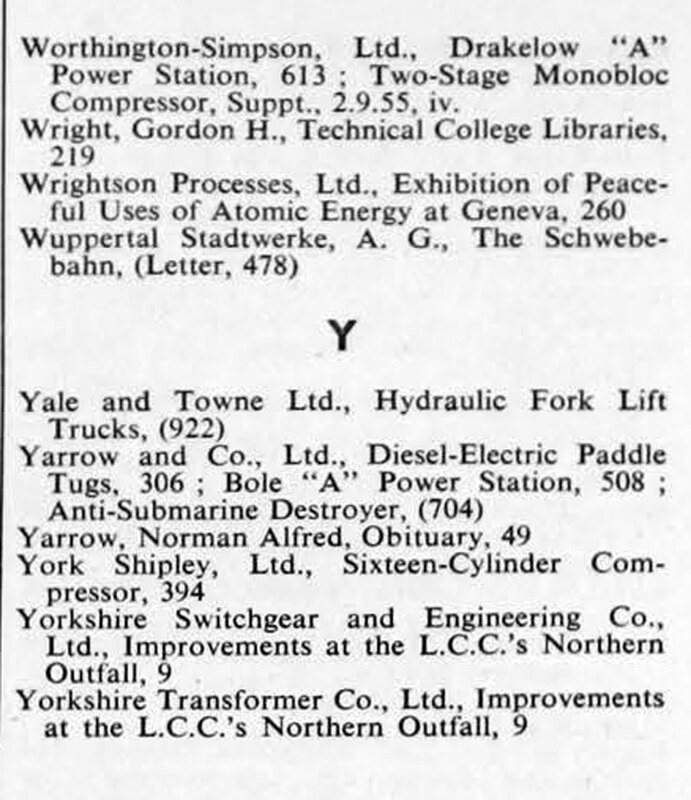 Hall, J. and E., Ltd., Eight-Cylinder, Veeblock, Refrigerating Compressor, Suppt., 2.9.55. xiii. Hayward Tyler and Co., Ltd., Exhibition of Peaceful Uses of Atomic Energy at Geneva, 339 Vertical Centrifugal Cargo Pump, Suppt., 2.9.55, xiv. Liquid-Filled Dynamometer Motor, Suppt., 2.9.55, xiv. 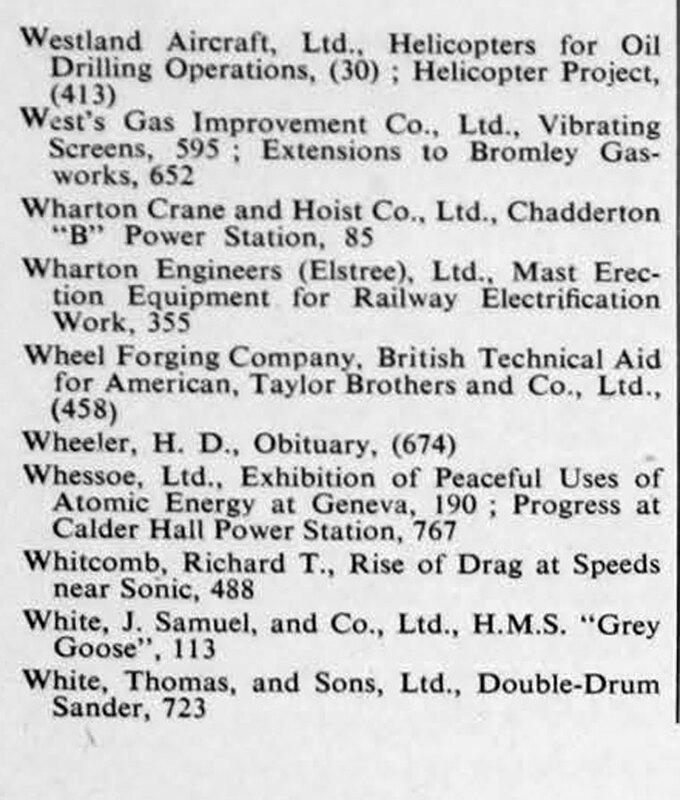 Holt, Alfred, Ltd., Gas Turbo-Generator, Suppt., 2.9.55, i.
Hopkinsons, Ltd., Chadderton "B" Power Station, 85 Boiler Mountings, Suppt., 2.9.55, xvi. 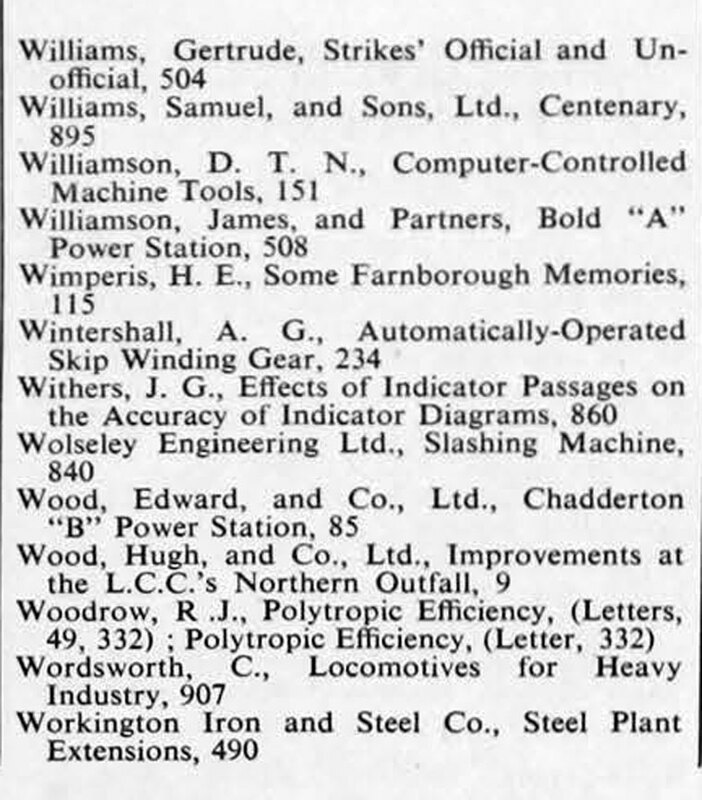 Howden, James, and Co., Ltd., Rotor Compressor, Suppt., 2.9.55, xi. Laurence, Scott and Electromotors, Ltd., Drakelow "A" Power Station, 613 Mooring Winch, Cargo Winch, Suppt., 2.9.55, viii. Lucas, J., (Gas Turbine Equipment), Ltd., Gas Turbo-Generator, Suppt., 2.9.55, i.
Marconi Instruments, Ltd., Trailer-Mounted 250kV Industrial X-Ray Apparatus, Suppt., 2.9.55, vii. Mono Pumps. Ltd., Cooling Water Pump, Suppt., 2.9.55, v.
Monometer Manufacturing Co., Ltd., Oil-Fired Hot Metal Receiver. Suppt., 2.9,55, iii. Neill, James and Co. (Sheffield), Ltd., Tool Bit Holder, 483 Permanent Magnetic Chuck, Suppt., 2.9.55, iii. Parsons. C. A., and Co., Ltd., Exhibition of Peaceful Uses of Atomic Energy at Geneva, 190 Three Cylinder Turbo-Generator, Suppt., 2.9.55, xii. Quasi-Arc Co., Ltd., Economics of Arc Welding, (350) Arc-Welding Plant and Electrodes Supply Organisation, 369 Portable "Sigma"
Ruston and Hornsby, Ltd., Improvement at the L.C.C. 's Northern Outfall, 9 Horizontal Oil Engine, 76 Flame Hardening of Crankshafts, 160 "Y.C." Class of Heavy-Duty All-Purpose Diesel Engine, Suppt., 2.9.55. vi. Sciaky Electric Welding Machines, Ltd., Continuous Seam Welding Machine for Long Components, 344 Heavy Duty Projection Welding Machine, Suppt., iii. Self-Changing Gears, Ltd., Role of the Railcar, (62) "R14" Diesel Railcar Gearbox, Suppt., xv. Spencer-Bonecourt-Clarkson, Ltd., Automatic Oil-Fired "Packaged" Boilers, Suppt., 2.9.55, v.
Spencer and Halstead Ltd., Rotary Table Machine, Suppt., 2.9.55, ix. Continuous Barrel Cleaning Machine. Suppt., 2.9.55, ix. Teddington Industrial Equipment, Ltd., Electric Control Instrument for Oil Burners, Suppt., 2.9.55, x.
Telelex Products. Ltd., Overhead Cable Conveyor. Suppt., 2.9.55, ix. Thornycroft, John I., and Co., Ltd., Pilot Launch, (278) Diesel Marine Engine, Suppt., 2.9.55, iv. Tuscan Engineering Co., Ltd., Self-Excited Self-Regulating Alternator, Suppt., 2.9.55, xvi. Ward, Thos. W., Ltd., Portable Rotary Feeder Hopper for Granular Materials, Suppt., 2.9.55, xiv. 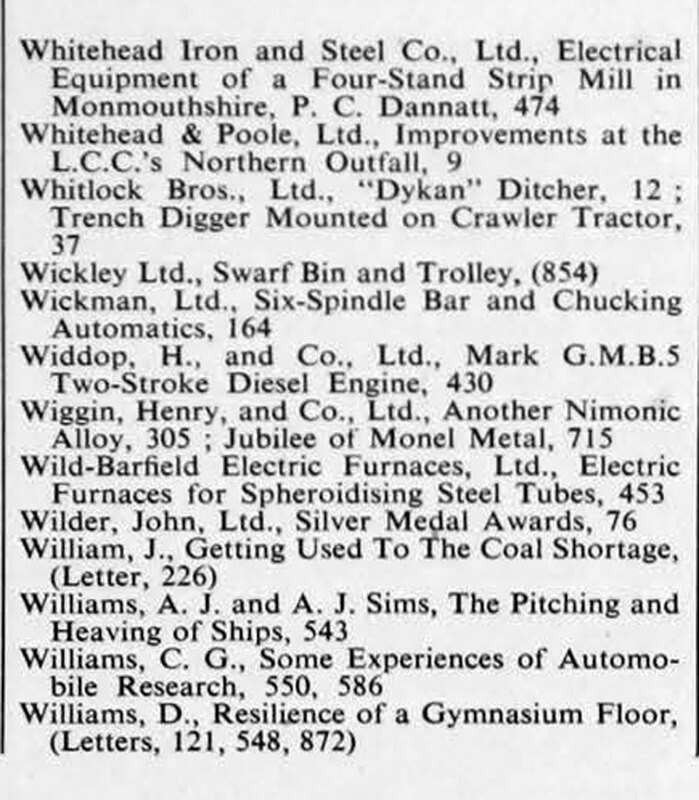 Weir, G. and J., Ltd., Drakelow "A" Power Station, 613 Closed Feed System for Ships, Suppt., 2.9.55, xiii. Worthington-Simpson. Ltd., Drakelow "A" Power Station, 613: Two-Stage Monobloc Compressor, Suppt., 2.9.55. iv. This page was last edited on 15 April 2019, at 16:09.